No pictures yet of my recent love affair with the armistice blouse, but here’s a sneak peek in the form of tatted edging. This is the collar that will soon be attached to my latest blouse. You can’t see it terribly well in the picture, but the fabric is a nearly sheer white with pale grey pin stripes. 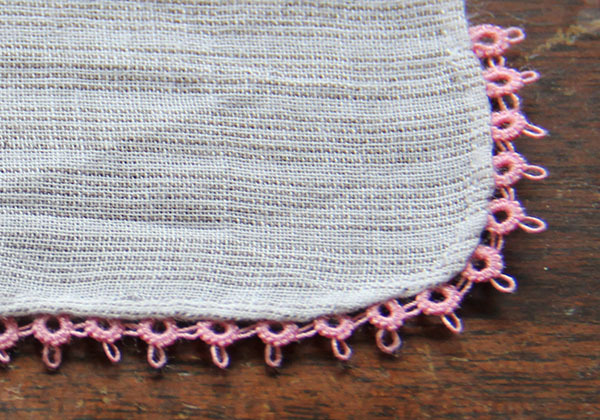 I used pink cotton for handkerchief hemming and fagotting, so naturally had to whip up a few lengths of pink tatted edging to match. It’s an embarrassingly simple pattern (I have yet to quite master the whole two-shuttle thing), but at least it works up relatively quickly. And it’s such fun taking my tatting around with me. Everyone is always curious about what I’m doing. But really, it’s easier to stick to the mid-20th century metal ones, with their handy little bobbins that pop in and out. 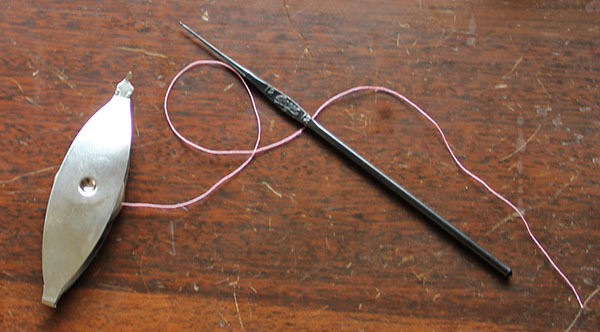 They even have a hook on the end for picking up the picots — though I find it works much better with a crochet hook. My absolute favorite shuttle is red plastic, without a separate bobbin (they can sometimes unwind at inconvenient moments) but I can’t seem to put my finger on its present location.